Our restaurant got its start in 1968 when Bunt King came home and announced to his wife Helen that he had found the perfect location for a steak house. Much discussion of the pros and cons of opening a family restaurant filled their home until the decision to take the chance was finally made. Ye Olde Steak House began when friends and family pulled together to help create a friendly, rustic, down-home atmosphere that still exists today. Over four decades, Ye Olde Steak House is still owned and operated by the King family. Bunt passed away in 1987, and Helen in 2003; now their three children - Nancy, Cheryl, and David continue with the family tradition. Even some of the grandchildren help out when possible. More than forty years, serving the best Iowa grain-fed beef has been customary. Thanks to our wonderful customers, a dream has become reality. We appreciate our customers, both new and old, and hope to serve 'steaks cooked to perfection' for many years to come. In November 2002, our building sustained damage as a result of fire. We temporarily moved to the L&N railroad station. We reopened this building on September 9, 2004. Thanks to our wonderful customers, we are back in business serving you. 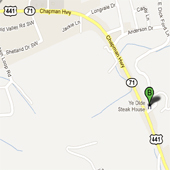 The steak house has become especially well known to University of Tennessee Football fans. It's on the list of the 100 Best Things about Tennessee Football and the 100 Best Secrets of the Great Smoky Mountains and one of the ten best steak houses in America. Gift Certificates are available for special occasions. All entrees are served with house salad, your choice of side dish and HOT homemade bread. Try our Woodshed Potatoes.